Pursuit was born in 1977 as a sub-brand of Tiara Yachts of Holland, Michigan, and as demand for them grew, a separate brand and a modern dedicated facility was built in Fort Pierce Florida for Pursuit Boats in 1983. Pursuit is still part of the Tiara Yacht family and is headed by Tom Slikkers, son of Tiara founder, Leon Slikkers who also founded Slickcraft Boats and S2 Yachts. 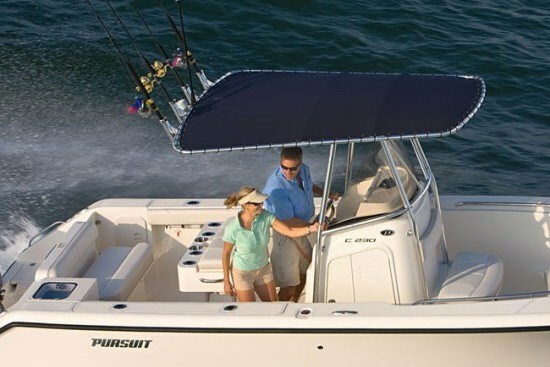 For 2013, Pursuit offers sixteen models from eighteen to thirty-eight feet in five series of Center Console, Sport Console, Dual Console, Offshore, and Sport Coupe models. The C 230 subject of this review is mid-range of Pursuit’s six center consoles from eighteen to thirty-one feet. Pursuit is not huge in terms of number of boats produced as manufacturers of pleasure boats go, but more dedicated to the perfection of hand built boats. Pursuit creates a Controlled Work Instruction for each step in the manufacturing process where every boat is documented along the build process and is signed off by each technician at every completed step for efficiency and consistency. Every process and result is measured and scores kept. For example, a high titanium custom formulation ferro ultra gelcoat for high UV protection along with the vinylester resins are stored in temperature and humidity controlled environments to ensure consistent lamination results. Each integral fibreglass and foam reinforced stringer system incorporates a state of the art vacuum bagged resin infusion process and is bonded precisely into the hull using a steel locating jig. Aluminum, not wood, backing plates are bonded into each deck where needed for cleats, downriggers, T-Top & seat bases, etc. Electrical panels are labelled both front and rear for ease of maintenance and every hardware, fitting or connection ever requiring maintenance will be accessible. The deep freeboard cockpit is fully self-draining. Six 8” stainless steel flush pull-up cleats are standard. All weather deck surfaces are Pursuit® custom diamond non-skid. 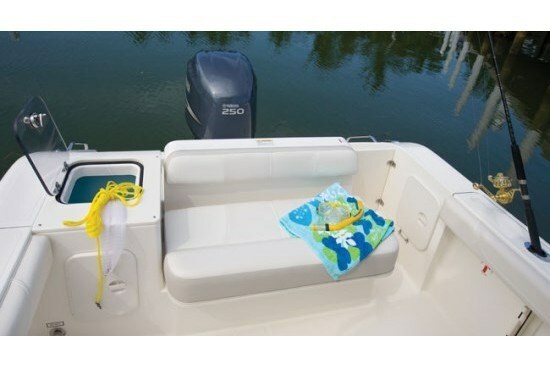 A large, self-draining rope and anchor locker is right at the bow, behind which is a fibreglass casting platform with 26-gallon fishbox/storage below and surrounded with a 1” diameter, one piece, recessed bow/safety rail. Add the optional cushions to this area for additional seating. 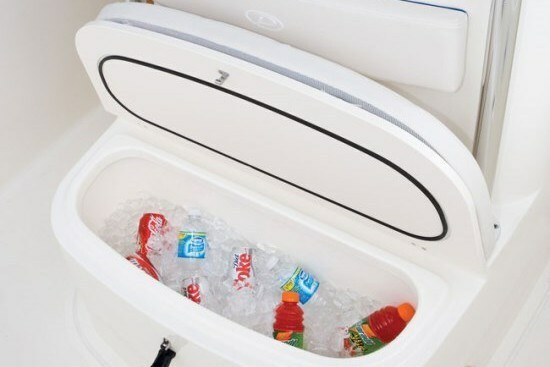 Facing this area and in front of the console is the aforementioned integrated molded two person cushioned console seat with built-in 60-quart cooler. 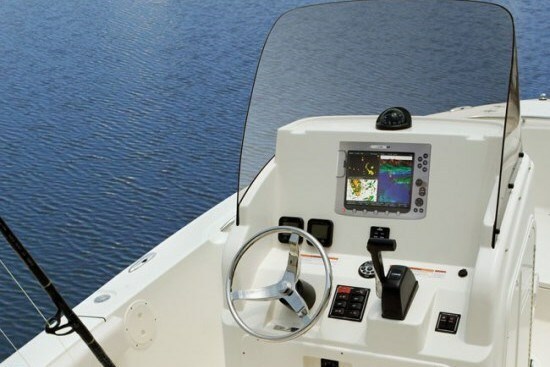 The handlaid fibreglass wrap-around center command console features a ¼” tinted acrylic windshield, molded footrest, portside mounted 15” polished stainless steel wheel supporting standard hydraulic steering, Ritchie compass, and controls for the standard Lenco® recessed trim tabs with indicators and auto retract feature. There is plenty of space provided on the front of this console for one or two large screen plotters or other electronics. The molded fibreglass interior of this console, accessed through a bi-fold side door, contains a standard portable head with pumpout and a surprising amount of head, knee, and elbow room. Other standard equipment includes cockpit coaming bolsters, four s.s. rod holders in the gunwale, two each port and starboard under gunwales rod racks, tackle locker, aluminum leaning post with bolster pad, four rod holders, and two s.s. cupholders, dual batteries with switch, raw water washdown with 25 feet of hose and sprayer, and a stainless steel telescoping boarding ladder recessed under a fibreglass hatch on the port side swim platform. 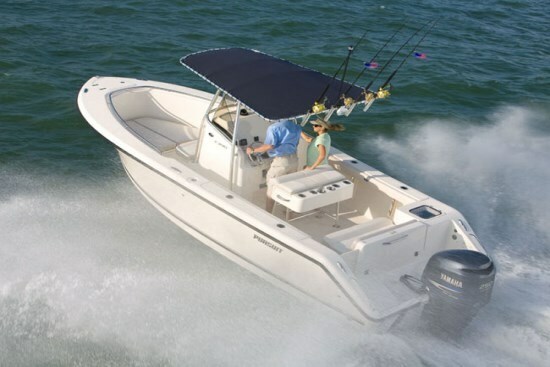 Notable options include Raymarine® GPS & radar electronics packages, underwater LED lighting, leaning post backrest with cushion, Clarion® AM/FM//CD stereo with four speakers, various canvas covers, bimini top, and the best option of all, a T-top with spreader light and more rod holders. A white hull is standard or opt for a yellow, light or dark blue, or even a “Stars and Stripes” color choice. Power comes from a single Yamaha® 250 electronic control 4-stroke outboard. Pursuit performance results with this power shows the most efficient cruising speed of just under 30 mph at 3500 RPM consuming just under 10 (US) gallons per hour for a range of 283 miles from the 105 (US) gallon fuel tank. Wide open throttle at 6000 RPM produced just under 50 mph. 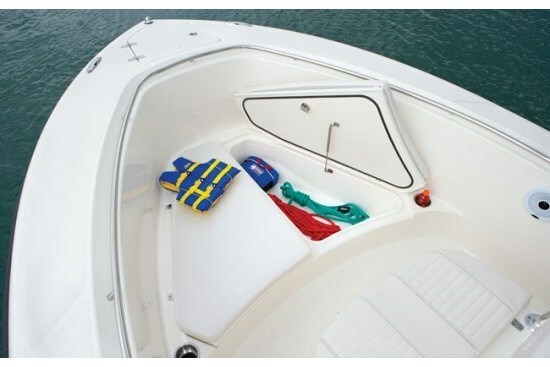 Center console boats generally seem to be gaining long awaited attention and a slow increase in popularity in Canada and the Pursuit C 230 certainly illustrates, with its attention to detail and versatility why that is so. This is a “wash and wear” boat requiring a minimum of maintenance, can be left out in the weather, and can be used for all manner of water recreation from cruising, to fishing, to wakeboarding and skiing. It is a boat for all reasons!